One or many? Homogeneous or inhomogeneous texture on imaging? Does the density or signal of the lesion resemble that of fat or water or is it different? Is it calcified? Is it septated? Are the lymph nodes around the liver hilum enlarged? Georgina Goodlooks (35) is still in shock. During an ultrasound examination of her abdomen a suspicious lesion was found in the liver, the precise nature of which remained unclear. Ajay reviews the MR images of Mrs. Goodlooks' liver together with friendly Dr. Longbreak (Fig. 9.40). Ajay finds the lesion and assigns it to segment V/VI of the liver. J^a, How Can You Remember Liver Segments ^^ According to Couinaud? tL A This is a surgical classification of liver segments p j^,_^ based on the veins of the liver, the major landmarks for surgeons during a liver operation. The portal vein marks the division between the caudal and cranial segments. Imagine you are a surgeon and view the liver through the opened abdomen of the reclining patient. You are looking at the liver hilum from underneath. The caudate lobe extends downward like a finger—that is segment I. From there you move counterclockwise around the hilum. First grab the dorsal (segment II) and the ventral (segment III) segments of the lateral left lobe of the liver. Now cross over the ligamentum teres to the medial part of the left liver lobe (cranially: segment IVa, caudally: segment IVb). Jump over the gallbladder further to the right lobe of the liver—segments V and VI. Finally feel (deep underneath the diaphragm) the cranial segments of the right liver—laterally segment VII and medially segment VII. Ajay first checks whether the lesion is really singular. Then he studies the internal structure with care. He works through the differential diagnoses one after the other-first the cystic and then the solid liver lesions. Fig. 9.41 a A developmental liver cyst displays a sharp margin, echo free contents, and a distal amplification of the echo. b This cyst, located in liver segment VIII after Couinaud, has the density of water and a sharp margin and does not enhance after contrast administration (left). Frequently one finds associated renal cysts, particularly in polycystic liver and kidney disease (right). Fig. 9.42 a The ultrasound examination finds the cyst at the underside of the liver. It contains numerous internal layers and structures. b In another patient a T2-weighted MRI shows the daughter cysts as defects within the cyst fluid (arrow). c After the interventional ablation of an echinococcal cyst with a mixture of alcohol and contrast, the remnants of the parasites are seen suspended in the cyst. tomography (Fig. 9.41b). 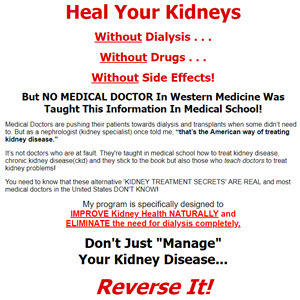 Often kidney cysts are also found, particularly in polycystic liver disease. Approximately 70% of patients with polycystic liver disease (Fig. 9.41b) also have polycystic kidney disease. 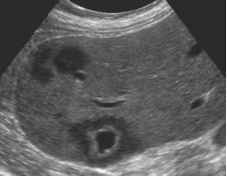 Very rarely a necrotizing metastasis presents as a cystic mass in the liver. Hydatid cyst: When the parasite Echinococcus granulosus (dog tapeworm) sets up shop in a human liver, it creates one or several cysts the walls of which typically have three layers and several appearances on imaging: They can look like normal cysts; they can contain so-called "hydatid sand"; they may show septations and their walls can calcify (Fig. 9.42). Patients tend to come from rural areas where dogs—the definitive hosts of the worm—are kept to herd livestock. The verification of the diagnosis is done serologically or by demonstrating scolices, the larval stage, in the cyst fluid during aspiration. Therapy today is often performed by the interventional radiologist. The lesion is punctured percutaneously and alcohol or hypertonic saline solution mixed with contrast medium is injected (Fig. 9.42c) under CT guidance. Amebic abscess: Amebic abscesses in the liver are typically caused by Entamoeba, which is endemic in developing countries. However, certain groups in developed countries are at high risk, such as recent immigrants and institutionalized patients, and it is found in the stool of up to 30 % of sexually active homosexual men. Amebic abscesses can be single or multiple; they develop in up to 7% of all patients with acute or recurring intestinal amebiasis, that is, 10% of the world population. In the industrialized world the abscesses are rare because Entamoeba histo-lytica is transmitted by contaminated water. Their appearance in ultrasound and CT (Fig. 9.43a) is not very specific. It is the patient history and the serology that confirm the diagnosis. thickening. This is a typical bacterial abscess. c In another patient with an acute myelogenous leukemia (AML) in neutropenia, multiple small abscesses are dispersed over the liver and spleen (arrows) that do not show any peripheral enhancement after contrast administration (check the vessels for the contrast!). This is the pathognomonic pattern of hepatosplenic candidiasis. Fig. 9.43a An amebic abscess appears sonographically as a hypoechoic lesion with a few internal echoes (left). In the CT of another patient (right) the wall of the amebic abscess (arrows) is thicker than that of a normal developmental cyst (see also Fig. 9.41b). b The transverse ultrasound image of the liver demonstrates several hypoechoic lesions anteriorly and a better-demarcated lesion dorsally with significant wall thickening. This is a typical bacterial abscess. c In another patient with an acute myelogenous leukemia (AML) in neutropenia, multiple small abscesses are dispersed over the liver and spleen (arrows) that do not show any peripheral enhancement after contrast administration (check the vessels for the contrast!). This is the pathognomonic pattern of hepatosplenic candidiasis. Fig. 9.44a The dilated biliary ducts are difficult to differentiate from cysts of other origin in CT. b A 3D T2-weighted MR image in maximum intensity projection (MIP) shows the cystic dilatations of the complete biliary system as well as the gallbladder and the choledochal duct. 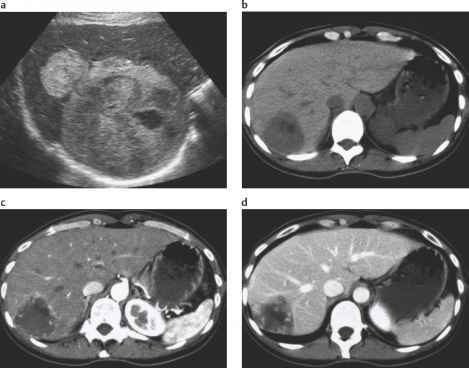 c The T1-weighted sequence after contrast administration displays the vessels within the dilated biliary ducts (arrow) very well, a finding that is pathognomonic for Caroli syndrome. duodenal ulcer, perinephric or subphrenic abscess); and as a complication of trauma (penetrating injuries). Depending on the content and the age of the abscess it can have no, little, or a strong internal echo on ultrasound. The type of margin also varies widely. In the final stage the abscess has a thick wall that enhances strongly after contrast administration (Fig. 9.43b). The patients are severely ill. Mycotic abscess: Mycotic abscesses are often disseminated and tend to occur in immunocompromised patients (can-didiasis). They may be small, and can be difficult to detect on CT as contrast enhancement is typically absent (Fig. 9.43c). Caroli syndrome: The congenital and very rare Caroli syndrome goes along with segmental cavernous ectasia of bile ducts in the liver (Fig. 9.44a). Morphologically it must be differentiated from other cystic processes. The proof of a communication of the cysts with the biliary system is reached by endoscopic retrograde cholangiopan-creatography (ERCP) or by magnetic resonance cholangiopancreatography (MRCP), for example in MIP (maximum intensity projection) (Fig. 9.44b). In this sequence the T2 weighting is so extreme that only fluids are visualized. The individual images are then added up to form a three-dimensional model. Patients are predisposed to developing biliary stones and may present with recurrent attacks of cholangitis. Vessels typically run centrally through the cysts (Fig. 9.44c). Patients suffer from a 100-fold increased risk of developing bile duct carcinoma. 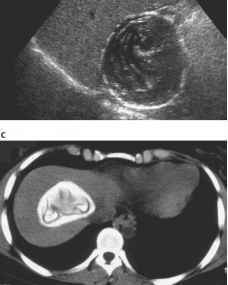 Liver hemangioma: A hemangioma is present in approx. 5 % of all patients and is the most common benign tumor of the liver. On ultrasound it displays a typical high echogenicity (Fig. 9.45a). 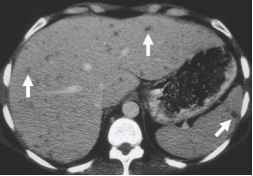 In multiphasic contrast-enhanced CT it typically demonstrates nodular peripheral contrast enhancement on early contrast phase, which gradually progresses to the center and is difficult to differentiate from the normal liver parenchyma in late-phase scans (Fig. 9.45b-d). Liver adenoma: Adenomas of the liver occur particularly in females after the regular intake of oral contraceptives. On ultrasound they tend to be echogenic, on CT and MRI they enhance markedly after contrast administration (Fig. 9.46). Imaging is not specific enough to permit omission of histological proof. Adenomas can reach a significant size and occasionally hemorrhage and rupture, resulting in a surgical emergency. Fig. 9.45a This giant hemangioma shows some hypoechoic and cystic areas within a tumor that otherwise exhibits the typical hyperechoic signal. b The CT of another patient displays the hemangioma as a hypodense lesion with ill-defined margins before contrast administration. c In the arterial contrast phase the peripheral vessels fill rapidly, giving the lesion an appearance that reminds some of cotton blossoms ("cotton-wooling"). d In the later phases, the cavernous spaces of the hemangioma fill up completely with contrast and eventually the tumor becomes isodense to surrounding liver. This may, however, take several minutes. Fig. 9.46a The T1 sequence without contrast shows a rather well demarcated lesion. b After gadolinium administration it enhances significantly. Focal nodular hyperplasia (FNH): FNH is the second most common benign liver tumor, seen predominantly in women taking contraceptives. On ultrasound the tumor has clear margins, little echo, and a central scar (Fig. 9.47a). 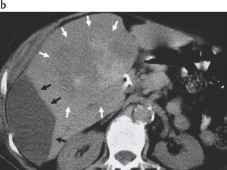 On CT the lesion appears hypodense on noncontrast images and enhances rapidly with contrast on arterial phase CT, when it is hyperdense compared to surrounding liver parenchyma. At that time the relatively hypodense central scar may be most discernible. 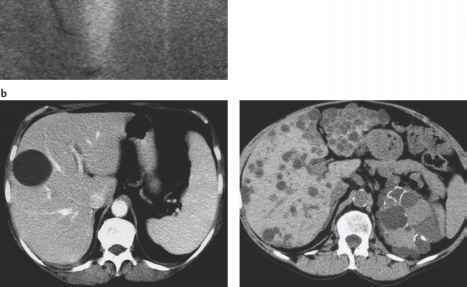 The lesions may become isodense to liver parenchyma on venous phase imaging and may be difficult to detect if only a monopha-sic contrast CT is performed. On MRI in T1 weighting, the tumor is isointense to liver and enhances markedly after gadolinium is given intravenously (Fig. 9.47b). Fig. 9.47a In this ultrasound section through the liver a slightly hypoechoic well-marginated lesion with a central scar is seen. This is a typical appearance for FNH. 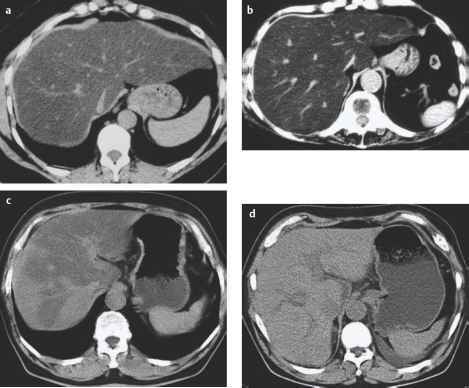 b The MR image in another patient (above, Tl-weighted; below, Tl-weighted after contrast administration) shows the tumor (arrows) with sharp margins and almost isointense to liver before contrast administration. The central scar is well seen on both sequences. on ultrasound without biliary stasis in the vicinity (Fig. 9.50a). On CT the tumor is partially hypodense, with an irregular serpiginous enhancement of the tumoral periphery after contrast administration (Fig. 9.50b, c). 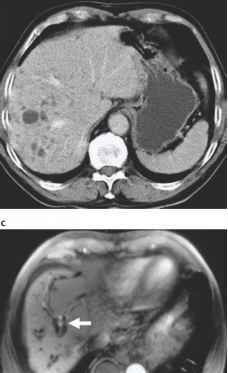 On delayed images, the tumor may retain more contrast than surrounding hepatic parenchyma and thus become conspicuous. Fibrolamellar carcinoma: This carcinoma is very rare. 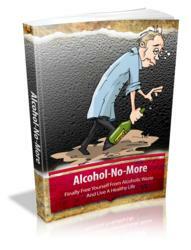 It occurs in the young and without any preexisting liver cirrhosis. It may be impossible to differentiate from focal nodular hyperplasia. Fig. 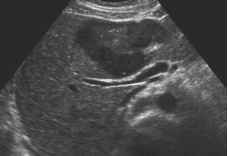 9.48a This large liver lesion—seen in a paramedian ultrasound image—is sharply marginated, solid, and inhomoge-neous. It is a liver metastasis. b Metastases of colorectal carcinomas are often dense in noncontrast CTs, which indicates tumoral calcifications, especially common in mucin-producing tumors. c In the arterial phase after giving contrast, almost all metastases enhance significantly and earlier than surrounding liver parenchyma. d As soon as the contrast also enters the liver via the portal vein, the parenchyma becomes denser and the metastases appear hypodense relative to the liver tissue. e In ovarian carcinoma the metastases tend to be cystic and are often located beneath the liver capsule (arrows) or implant themselves into serosal surfaces in the abdomen. lesions and is quite happy that the news for Mrs. Good-looks is good. Longbreak spoils his excitement somewhat when he explains that adenomas tend to hemorrhage and are frequently resected for that reason; the FNH is difficult to differentiate from fibrolamellar carcinoma. Either a short-term follow-up is needed or a tissue sample must be retrieved. The biopsy is done on the following day and confirms the adenoma. Mrs. Goodlooks discontinues her oral contraceptives and is invited for a follow-up ultrasound or MRI in three months to confirm the size decrease of the adenoma. f Normal cysts and most hemangiomas can be diagnosed i with sufficient certainty solely by imaging. Lesions of infectious or parasitic origin tend to come with a fitting clinical symptomatology and history. Multiple solid lesions are metastases until proven otherwise. In all other doubtful cases, short-term follow up is warranted, or tissue samples need be taken, or the lesion needs be removed completely. Fig. 9.50a This cholangiocarcinoma is rather hypoechoic along its periphery. Dilated biliary ducts are not present. b In another patient the tumor (white arrows) has an irregular margin and is hypodense. In addition there is a subcapsular biloma (biliary retention; black arrows). c After contrast the tumor enhances in the periphery in a geographic pattern often seen in CCC. Has the patient received chemotherapy? Is there a history of chronic hepatitis? Is there right cardiac failure? Violetta Countess Campari (62) has been examined as part of her follow-up protocol for a previous breast carcinoma. The referring oncologist is naturally interested in whether she has developed any metastases. Giufeng has not found any focal lesions in the liver. She already wants to pass on to the next patient as Gregory comes by and views the images on the monitor with awe. "Just look at that! I need a copy of these," he shouts. "Boy, this is textbook stuff!" Giufeng is taken by surprise; she returns to the scanner and takes another careful look at the images (Fig. 9.51). Fig. 9.51 Look at this decisive CTscan of Countess Campari. Can you find anything? contrast is administered intravenously. If the steatosis is less severe, the vessels may become invisible altogether. c This CT-section shows a regional steatosis after chemotherapy. d Eight weeks later the liver has returned to its normal homogeneous appearance. Fig. 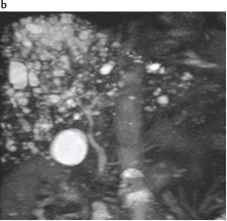 9.53 a In this patient with advanced liver cirrhosis, dense regeneration nodules are detectable even before contrast is administered. The surface of the organ is nodular, the caudate lobe (arrows) is enlarged. b If a portal hypertension ensues, the spleen is enlarged, the superior mesenteric vein is often congested (black arrow), and the umbilical vein is recanalized and dilated as part of a collateral system (white arrow), which allows blood to bypass the liver and drain into systemic veins. Note the ascites around the spleen. otherwise healthy adults. It can develop within a few weeks and can also disappear within such a time frame. In addition to an unhealthy fatty diet and alcohol abuse, diabetes mellitus or chemotherapy can lead to this effect (Fig. 9.52c). The steatosis can encompass the whole liver (fatty liver) or remain segmental. If a small part of the liver is spared from the fatty infiltration it can take the appearance of a (pseudo)liver lesion on CT or ultrasound. For obvious reasons, this must be differentiated from focal liver disease such as a primary or secondary tumor. Circumscribed fatty infiltration of the liver parenchyma is often seen adjacent to the falciform ligament. 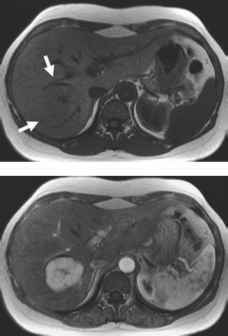 In critical cases, MRI with and without fat saturation or a core biopsy will help differentiate true liver lesions from focal sparing in a patient with otherwise fatty liver. Liver cirrhosis: Liver cirrhosis manifests itself with a few changes that can be visualized with imaging modalities. The liver volume increases in the early phase, the outer contour becomes irregular, and regenerative nodules develop (Fig. 9.53a). Later the liver may shrink and, as a consequence of progressive fibrosis around the portal vessels and bile ducts and the disorganized regeneration of hepatocytes in nodules, the microcirculation of the liver is gradually destroyed and portal hypertension develops (Fig. 9.53b). The consequences are an enlarged spleen, as-cites, and increase in the size of collateral veins, which decompress the portal system into the systemic venous circulation, frequently via the veins of the gastric fundus and the esophagus as well as in the retroperitoneum into the left renal vein. These enlarged veins are called varices and bleed easily, a potentially lethal event. The interventional radiologist can create a shortcut from a large portal vein branch into a large hepatic vein within the liver itself by implanting a transjugular intrahepatic portovenous stent-shunt (TIPSS), thus relieving the abnormally high pressure in the portal venous system (see p. 108). f In a nodular cirrhotic liver, focal lesions such as metastases i or hepatocellular carcinomas can be masked and can remain undetected. 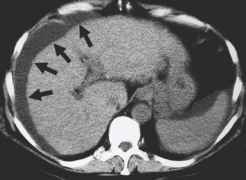 Hemochromatosis: Hemochromatosis, an abnormally increased iron deposition within the liver, is easily appreciated even on noncontrast CT because the liver density is diffusely increased in comparison with the spleen and the liver vessels (Fig. 9.54). Later a liver cirrhosis develops with all the potential side effects and consequences. The disease occurs in young adults and often necessitates liver transplantation. • Diagnosis: Giufeng must confess that she simply overlooked the extensive but homogeneous fatty infiltration of Countess Campari's liver. Gregory knows why: "You probably concentrated too much on the patient's history. There were no metastases and so the examination was all finished for you. Could also have been a simple case of 'satisfaction of search.' You're lucky—in this case it's not a problem. But I definitely need one of the images for my teaching file." Fig. 9.54 The density of the liver is increased relative to the density of the spleen. 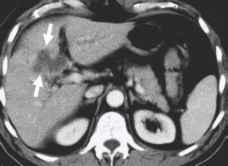 The liver has already developed a cirrhosis, its surface is irregular, and ascites abounds (arrows). • Is there a history of biliary colic? 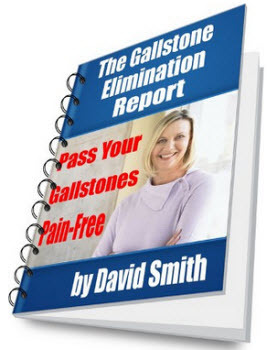 • Does the patient have known gallstones? Don Cramp (55) has complained about nonspecific pain in the upper abdomen for two days. His general practitioner has a suspicion that his eyes have turned yellow just a bit. Joey is covering CT today. Mr. Cramp comes straight from the internal medicine clinic and an ultrasound examination to the CT unit. The ultrasound report is handwritten and impossible to decipher. Joey puts it aside to concentrate on the CT examination (Fig. 9.55). Fig. 9.55 What is there to see on this CT section of Mr. Cramp? Fig. 9.56a The stone within the gallbladder is seen well sono-graphically—the distal acoustic shadow is quite characteristic. The gallbladder wall shows normal thickness. 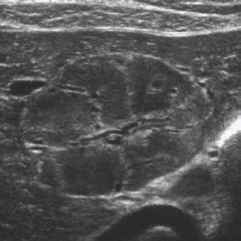 b This stone in the common bile duct of another patient (long arrow) has led to a swelling of the gallbladder wall as part of an acute inflammation (cholecystitis, short arrows). The thickness of the bladder wall exceeds the normal value of 1-2 mm. Acute cholecystitis: This acute inflammation of the gallbladder is frequently the consequence of an obstruction of the cystic duct or the infundibulum of the gallbladder due to a stone. On ultrasound the thickening of the gallbladder wall is typical (Fig. 9.56a), and sometimes there is an accompanying inflammatory reaction of the neighboring liver parenchyma (Fig. 9.56b). The diagnosis of cholecystitis is made on the basis of the clinical picture, however. Stone migration/stone impaction: A migration of a stone into the cystic duct and onward into the common bile duct is always accompanied by colicky pain. If the stone becomes impacted in the infundibulum of the bladder or in the cystic duct, thereby occluding or severely narrowing the common bile duct from outside (Mirizzi syndrome), or if the main choledochal duct is obstructed by stones, bile backs up into the liver; this is also called cholestasis. Gallbladder carcinoma: A primary adenocarcinoma of the gallbladder can develop in the wall of the gallbladder and its immediate vicinity can be infiltrated by this tumor (Fig. 9.57). Risk factors for the development of gallbladder carcinoma are cholecystolithiasis and chronic cholecystitis. One late symptom may be obstructive jaundice. Cho-lestasis, however, can also have other causes (Fig. 9.58a). One possibility is a small cholangiocarcinoma located at the bifurcation of the common hepatic duct (Klatskin tumor) that can cause severe cholestasis (Fig. 9.58b). Small tumors can obstruct and dilate the biliary system without themselves being detectable on CT. Fig. 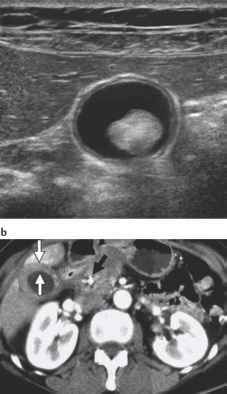 9.57 The tumor is located in the bed of the gallbladder (arrows); it infiltrates the adjacent structures and shows little enhancement after contrast administration. Fig. 9.58a If the dilated biliary ducts are detectable alongside the vessels (arrows) this is called the "shotgun sign." Come back to this image after you have seen the next case to find the cause of the biliary obstruction—or are you smart enough already? Duajuasauj aqj pajejjujuj Apeaj|e sei| pue uojpnjjsqo Ajej|jq ai|} sasnbd ipii|m 'peai| djjeajdued aqj jo bujou|djbd e s| ajaqi b In another patient with a Klatskin tumor, the biliary obstruction is even more pronounced. The tumor itself remained beneath the detection threshold of CT. Fig. 9.59 The extensive dilatation of the bileducts is well seen. Stones may also be demonstrated with ease. Caroli syndrome: Caroli syndrome is an extreme and rare form of congenital cavernous ectasia of bile duct dilatations of the biliary system. 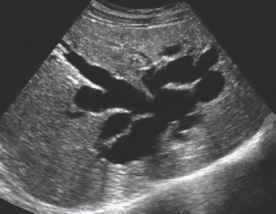 It is diagnosed very well by ultrasound because the dilatation of the biliary ducts is easily seen (Fig. 9.59; see also Fig. 9.44a). • Diagnosis: Joey checks the biliary system and finds it normal in caliber. But the gallbladder bed has a strange appearance. Is this an advanced cholecystitis? And then there is a round lesion close to it in the liver parenchyma! The contour of that lesion is so ill-defined that a cyst seems very unlikely. He adds up all the findings: a carcinoma of the gallbladder with regional metastases in the liver would explain all of it. Giufeng drops by for lunch and agrees—a nice conclusive diagnosis. A week later Mr. Cramp comes back for his staging CT of the chest—a biopsy has confirmed the gallbladder carcinoma. Is there a history of alcohol abuse or diabetes? Does the patient complain about epigastric pain that radiates to the sides and back like a belt? Is there steatorrhea? Are the caliber and contour of the pancreas normal? Are the pancreatic ducts dilated or irregular? Is there is a definite tissue plane between the pancreas and surrounding structures? Fig. 9.60 These are the relevant sections of a CT through Mr. Booze's upper abdomen (a) and the pelvis (b). Can you think of a diagnosis already? Timothy Booze (37) is not exactly an uptown boy and life has not been too kind to him. He tends to drown his regular frustrations in alcohol. His fingernails have turned yellow from chain-smoking filterless cigarettes. Yesterday evening he developed constant pain in his upper abdomen. This morning he barely made it to the walk-in clinic of the local city hospital. He simply couldn't take the pain any longer. The physician of the day examines him and then orders a CT to see what's going on in his belly. Hannah is working in the CT unit today and studies the examination. Two of the axial images particularly attract her attention (Fig. 9.60). Acute pancreatitis: Acute inflammation of the pancreas is caused by alcohol abuse or blockage of the pancreatic ducts (most commonly by gallstones) in 90% of cases (Fig. 9.61a). The extent of the inflammation is best evaluated by CT, but the diagnosis itself is based on the clinical appearance and the laboratory findings—in particular serum amylase and lipase. Fig. 9.61 a The noncontrast CT scan displaying the corpus and tail of the pancreas demonstrates coexisting swelling and ill-defined margins of the gland (left). Fluid collections extend into the splenic bed. 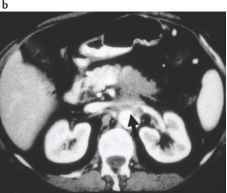 After contrast administration, a perfusion defect in the body of the pancreas is appreciated (right; arrow). This indicates partial organ necrosis. b Chronic pancreatitis is characterized by coarse popcorn-like calcifications along the course of the pancreas (white arrows). 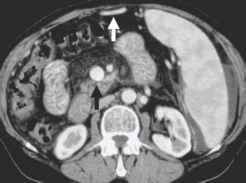 The pancreatic duct is slightly dilated (black arrow). Fig. 9.62 You see here a typical microcystic pancreatic adenoma. The tumor is located anterior to the vena cava and aorta (arrows) and shows characteristic calcifications and small cysts. Histological work-up and verification are necessary in any case. 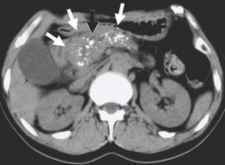 Pancreatitis may cause swelling of the gland that may be associated with ill-defined borders. Stranding of the surrounding fat planes develops. The lipolytic and proteolytic pancreatic secretions find their way through the retroper-itoneal spaces into and around Gerota's fascia to the kidneys and along the iliopsoas muscle down into the groin. Another commonly affected structure is the mesocolon. 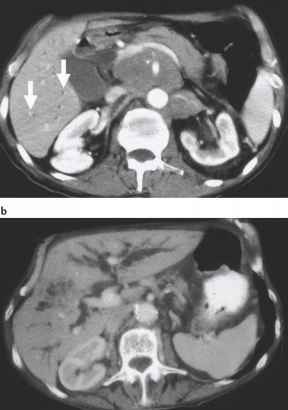 Fluid collections, so-called "pseudocysts," can form in and around the pancreas (see also Fig. 7.11, p. 108). 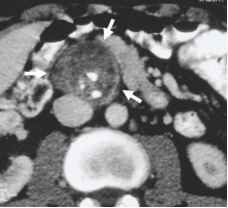 Not every pancreatitis results in changes of the CT appearance of the gland. 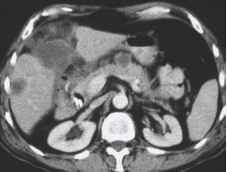 Thus pancreatitis cannot be excluded by CT. Chronic pancreatitis: Chronic pancreatitis is the consequence of recurring bouts of inflammation (Fig. 9.61b), frequently in persistent alcohol abuse. Calcifications begin to line the course of the pancreas, the pancreatic ducts (the little side branches in particular) are irregularly dilated, which is easily diagnosed on MRCP. Fig. 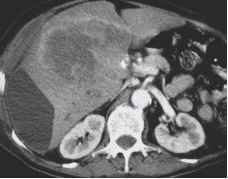 9.63a This CT section shows an extensive unresectable pancreatic carcinoma. The tumor (white arrow) completely surrounds the celiac trunk. It has caused a biliary obstruction, which has been treated/drained with a biliary stent (black arrow, see the stent tip in the duodenum). Liver metastases and extensive ascites are already present. 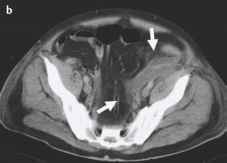 The reason for the ascites is most likely a peritoneal carcinomatosis. b In this patient the cancer infiltrates the duodenum and the para-aortic space (arrow). c This tumor alters the organ contour just a little. Only after contrast administration does it become well visible as a low-attenuation lesion surrounded by normally enhancing pancreas (arrow). multiple pancreatic adenomas. Biopsy is best obtained minimally invasively by ultrasound- or CT-guided percutaneous core needle biopsy or by ultrasound-guided endo-scopic biopsy from stomach or duodenal lumen. Pancreatic carcinoma: Pancreatic carcinoma—when located in the head of the pancreas—becomes symptomatic with painless jaundice in half of cases (Fig. 9.63a, b). Apart from that the symptoms remain rather nonspecific. Any irregularity of the pancreatic contour is suspicious and should be analyzed with special care (Fig. 9.63c). The tumor tends to be hypovascularized in comparison to the surrounding parenchyma. Therefore, multiphasic contrast-enhanced CT or MRI are the best tests to detect its presence. If the celiac vessels, the portal vein and the me-senteric vessels are encased, the tumor becomes un-resectable for the surgeon. Therefore the radiologist should carefully examine the relationship of the tumor to the vessels close by and comment on it. Liver metastases are also not infrequent. The detection of a carcinoma within a chronically inflamed organ poses a particular challenge because the pancreatic parenchyma can be scarred from the inflammation and mimic a tumor. 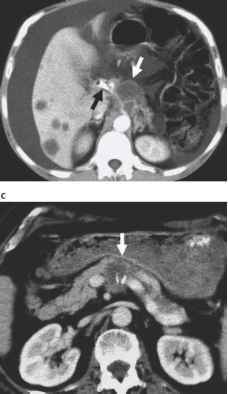 In the imaging of pancreatic carcinoma, determination of surgical resectability is the primary issue apart from the diagnosis itself. Islet cell neoplasm: An islet cell tumor, such as an insulinoma or gastrinoma to name the most frequent ones, is normally diagnosed on the basis of the clinical symptoms, which are caused by the hormone production, and with laboratory tests. Imaging is mainly used to localize the tumor preoperatively (Fig. 9.64). • Diagnosis: Hannah has never had any doubt that this must be a case of acute pancreatitis—the clinical history was so obvious. The inflammation is severe in Mr. Booze's case, the fluid collections can be followed all the way into the groin, and a large necrotic defect is present in the body of the pancreas. Probably pseudocysts will develop in the days to come. Mr. Booze has a few tough weeks ahead of him. How long would a klatskin tumor go undetected? What does a echinococcus cyst associated with water lily sign look like on ultrasound? What does fatty liver mcrp? Why cannot diagnose hemangioma with certainty? 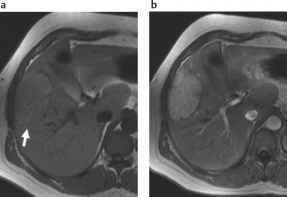 What does liver look like on mri in billiary obstruction? What does bile filled biliary system look like sonographically?